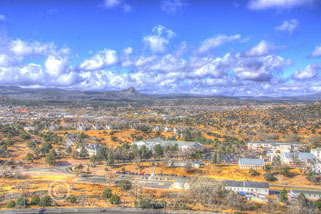 click photo to enlarge We have been going to Prescott Arizona on average twice a year since 1997 after my Aunt moved there. Once we moved to California it was only a 6 hour drive. We fell in love with the place the first time we were there. It was our first trip to Arizona and the cowboy west. We love the wide open spaces and views in Arizona. 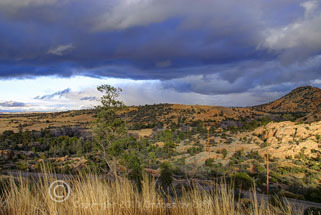 Prescott does a wonderful job preserving their western cowboy heritage. This trip was a bittersweet one since we were going for my Aunt's memorial. We spent a total of 11 days there and a lot of time exploring the area since we figured we will not be going there as often anymore. Of all the places we have considered for retirement I think we both like Prescott the best. 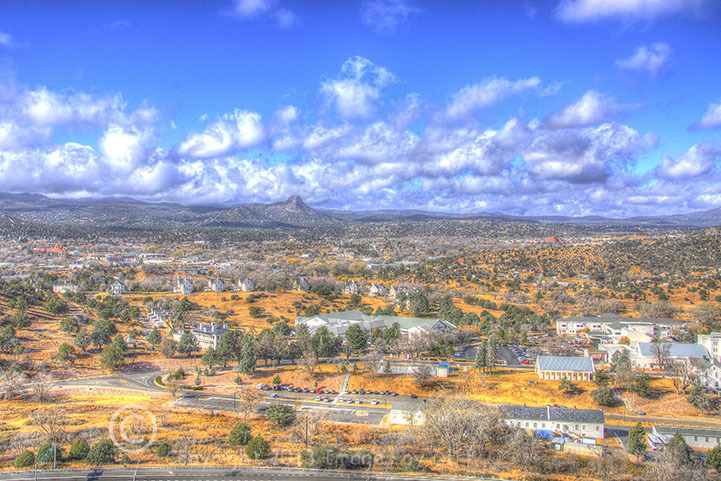 The picture to the left is Fort Whipple in the foreground and Thumb Butte in the distance. click photo to enlarge We spent an entire day going around to some of the more scenic areas taking pictures. Our friends Craig and Sandra were with us. After telling them about Prescott for so many years we wanted to share it with them. 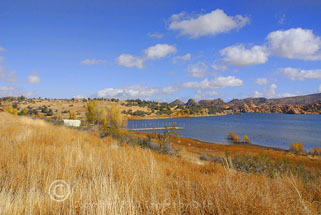 The view to the left is Watson Lake at one of a number of parks in Prescott. 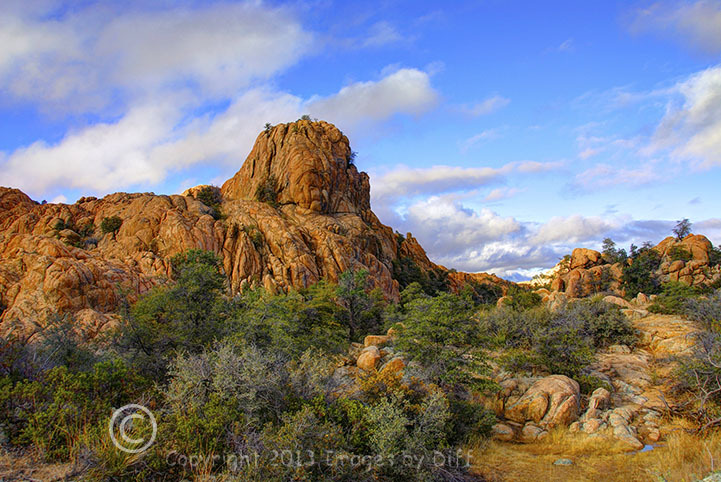 Watson Lake borders the Granite Dells. It is down kind of low because of the dry weather out west. 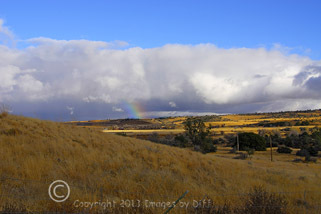 click photo to enlarge We were at the Phippen Museum when I looked out the window and noticed this rainbow. For us the scenery is just incredible. 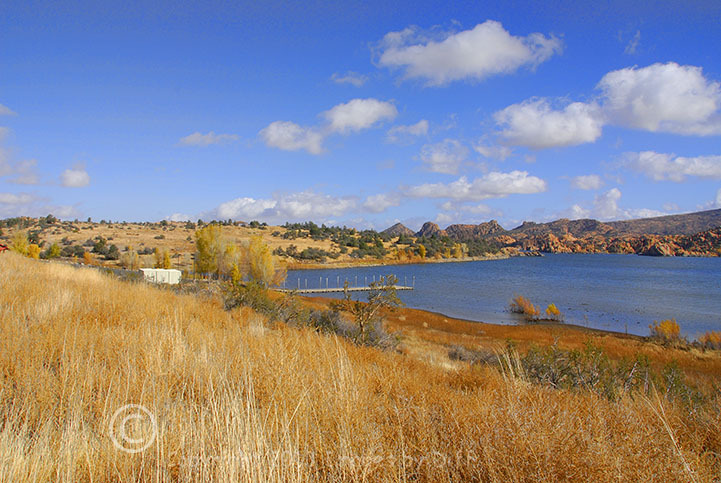 When we came home I had to buy the movie Jr. Bonner because it was filmed in Prescott. One of Karen's favorite stops is the Galloping Goose to pick up some jewelry. The woman who works there even remembers us that is how often Karen goes in there. It is always fun to browse the shops on Whiskey Row. Then we are always amazed at the number of wonderful local restaurants we find there. 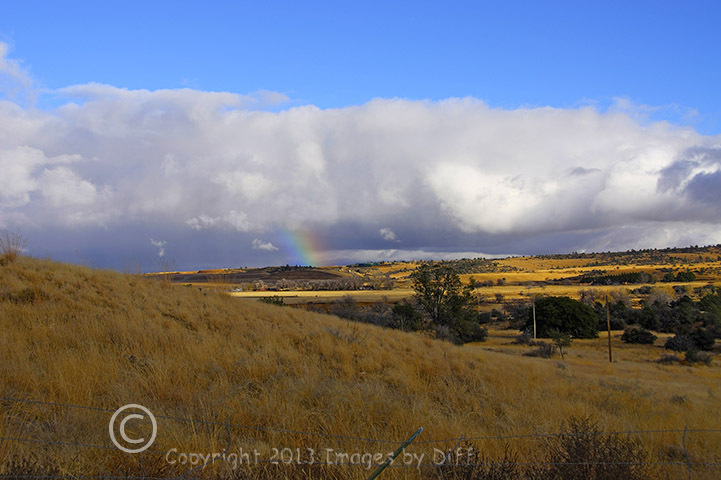 So while my Aunt is now departed I suspect we will still go to Prescott just not as often.